Satya Kudapa has over 15 plus years of experience working with enterprises in bringing holistic approaches to problem solving, process innovation, and product/service improvements. Satya encourages a hands-on approach to developing leadership and workforce skills that drive business process value to attain profitable and sustainable bottom-line impact. 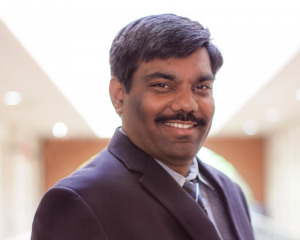 Satya is one of the lead instructors for the Lean Six Sigma program, Basic and Advanced SPC, Internal Audits (ISO 9001 and AS 9100), Lean Manufacturing Practices, Problem Solving and Root Cause Analysis. Satya also has a working knowledge in the areas of Process and Tooling validations, Quality Process Approvals (APQP/PPAP) and Quality Assurance. Satya has an expanding interest in the areas of Smart Manufacturing, Cyber Security and Internet of Things. Satya has provided project management, training and professional business consultant services to over 100 plus enterprises in the North Texas region that span a wide variety of industry clusters including medical, aerospace, defense, fabrication, energy distribution and city governance. Since 2003, he worked at TMAC in various positions, assisting with project management, process improvements, facility layouts, utility studies, Lean manufacturing implementations/Kaizens, and Quality Management System Implementations. Satya also actively pursues Continuous Improvement and Workforce Development practices by the application of Lean, TOC, TWI and Toyota Kata Principles. Satya has successfully led several ISO/AS9100 implementations in a wide variety of industries that include fabrication environments, electronics industry, communication/cable manufacturing, city, foam lamination and bonding, and governance. In addition, Satya has conducted ISO 9001 and AS 9100 internal audits at over 60 different organizations over the span of last 10 years. Since 2010, Satya has taught several Lean Six Sigma (LSS) Green Belt and Black Belt classes. In addition, he also actively assisted the Belts in their LSS projects as a mentor/coach by providing guidance in their projects. Over the past 4 years Satya has actively worked with a key customer as a Master Black belt on hire. His responsibilities include assisting the organization with oversight over their LSS program execution, working with senior leadership with assessing program maturity, candidate selection, project selection, sponsor development and belt coaching. At this organization, Satya has so far trained 80+ Green Belts, 12 Black belts and presided over 500+ coaching sessions. Satya is also currently working with organizations assisting them with Smart Manufacturing Readiness Assessments and with the implementation of Cybersecurity Management Systems (in compliance to NIST 800-171 Standards). Satya holds a Master of Science degree in Industrial Engineering from the University of Texas at Arlington and a Bachelor of Engineering degree in Production Engineering from Madras University, India. Satya is certified as a Lean Six Sigma Master Black Belt, a State Of Texas – Texas Awards for Performance Excellent Examiner (TAPE) and a certified Internal Auditor for ISO 9001 and AS9100 standards. Satya is member of Tau-Beta-Phi, Alpha-Pi-Mu and Phi-Beta-delta. Satya was previously a member of APICS and the Indian Institute of Production Engineers. Satya has made presentations at the Lean Six Sigma World Conference (2017) and several local chapters such as ASQ meetings (Fort Worth Chapter), National Tooling and Manufacturing Association meetings, TMAC hosted events. Satya’s past professional experience includes working as an Industrial Engineer at the Blockbuster Distribution warehouse in Mesquite, TX. Prior to that Satya Worked as a Graduate Research Assistant for TMAC, providing industrial engineering support on numerous projects over a period of 3 years.